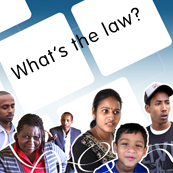 This catalogue lists legal resources targeted at newly arrived migrants and refugees. Information about the stage in the settlement process when it may be appropriate to access the resource. Programs and services to familiarise migrants and refugees with available services and provide for their needs following arrival. Direct assistance – Programs and services to assist migrants and refugees to operate independently in Australian society and access mainstream services. This catalogue is not a comprehensive list of all available resources that have been translated into languages other than English. The catalogue focuses on resources that are appropriate to newly arrived migrants and refugees. Welcome to Australia - a new home presents important settlement information for refugees coming to Australia from Asian countries under Australia's humanitarian program. This video provides an overview of how things work in Australia and the services available to newly arrived refugees. A series of short videos with orientation information including Australian law covering issues such as police, driving, road safety, public transport and legal aid. Contact DIBP on 13 18 80 to order copy of Book and DVD. See also Youtube - Our Common Bond. Issues faced by young migrants and refugees in relation to settlement. The Fair Trading NSW website has publications about consumer related issues that are translated into a range of languages. NB: Needs updating to tenancy and consumer laws. Explains different options and the processes step by step. Languages: See NSW Fair Trading website home page (www.fairtrading.nsw.gov.au) and click on languages button to access translated resources available in various languages. Rights and responsibilities as consumers and tenants in NSW - note click on link at top of page to translated publications to find the topic/language required. Drivers Licenses - Moving to NSW - note click on link at top of page to International Drivers and Riders to source information in English. Many other helpful immigration law related issues. The DIBP website has information about visas, immigration and settling in to Australia including settlement service programs and learning English. Information about the role of registered migration agents, how to make the most of an agent's service, options available if there are problems and the role of MARA as the regulatory authority. Centrelink provides on it's website translated publications by category and publication for community groups to help customers. 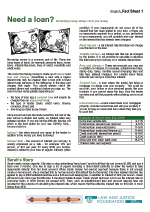 Centrelink has a range of publications that are translated into different languages. Topics include: My relationship with my visa sponsor (husband or partner) has ended – What do I have to tell the Department of Immigration (DIBP)? Can I stay in Australia or get permanent residency, if the relationship has ended? Is it true that my Australian husband / partner can deport me? What happens if my ex-partner tells DIBP he is withdrawing sponsorship of me? What do I do if my ex has my passport or other documents? This is a pamphlet with information about Women’s Legal Service NSW including the types of matters WLS will provide legal advice on and telephone advice line contact numbers. The brochures are available in ten community languages: Arabic, Dari, Dinka, Farsi, Filipino (Tagalog), Hindi, Kirundi, Mandarin, Tamil and Vietnamese. Is someone asking the court to make an AVO against you? Information for defendants. Are you applying for an Apprehended Violence Orders (AVO)? Information for people needing protection. So you want the violence to stop - advice about domestic violence and help at court. Website - choose language using drop down menu at top right hand side of web page and Factsheets are translated.